The following statements produce a time series plot of the series by using the TIMESERIES procedure (see Chapter 32: The TIMESERIES Procedure). 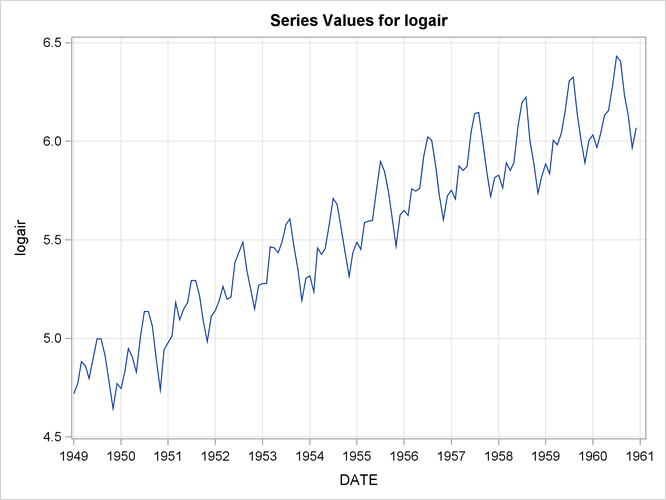 The trend and seasonal features of the series are apparent in the plot in Figure 34.1. The PROC UCM statement signifies the start of the UCM procedure, and the input data set, seriesG, containing the dependent series is specified there. The optional ID statement is used to specify a date, datetime, or time identification variable, date in this example, to label the observations. The INTERVAL=MONTH option in the ID statement indicates that the measurements were collected on a monthly basis. The model specification begins with the MODEL statement, where the response series is specified (logair in this case). After this the components in the model are specified using separate statements that enable you to control their individual properties. The irregular component is specified using the IRREGULAR statement and the trend component is specified using the LEVEL and SLOPE statements. The seasonal component is specified using the SEASON statement. 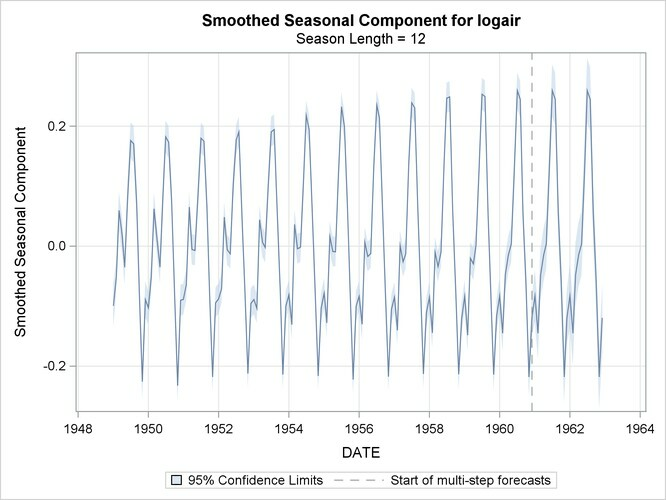 The specifics of the seasonal characteristics such as the season length, its stochastic evolution properties, etc., are specified using the options in the SEASON statement. The seasonal component used in this example has a season length of 12, corresponding to the monthly seasonality, and is of the trigonometric type. Different types of seasonals are explained later (see the section Modeling Seasons). The parameters of this model are the variances of the disturbance terms in the evolution equations of , , and and the variance of the irregular component . These parameters are estimated by maximizing the likelihood of the data. The ESTIMATE statement options can be used to specify the span of data used in parameter estimation and to display and save the results of the estimation step and the model diagnostics. You can use the estimated model to obtain the forecasts of the series as well as the components. The options in the individual component statements can be used to display the component forecasts—for example, PRINT=SMOOTH option in the SEASON statement requests the displaying of smoothed forecasts of the seasonal component . The series forecasts and forecasts of the sum of components can be requested using the FORECAST statement. The option PRINT=DECOMP in the FORECAST statement requests the printing of the smoothed trend and the trend plus seasonal component ( ). The parameter estimates for this model are displayed in Figure 34.2. The estimates suggest that except for the slope component, the disturbance variances of all the components are significant—that is, all these components are stochastic. The slope component, however, appears to be deterministic because its error variance is quite insignificant. It might then be useful to check if the slope component can be dropped from the model—that is, if . This can be checked by examining the significance analysis table of the components given in Figure 34.3. The table given in Figure 34.4 shows the goodness-of-fit statistics that are computed by using the one-step-ahead prediction errors (see the section Statistics of Fit). These measures indicate a good agreement between the model and the data. Additional diagnostic measures are also printed by default but are not shown here. 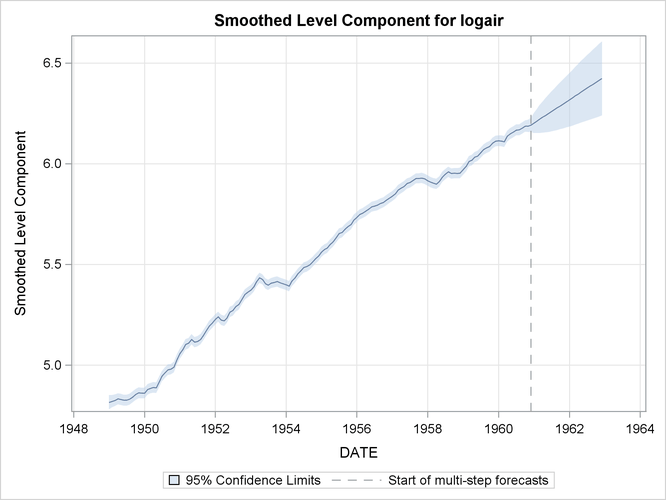 The first plot, shown in Figure 34.5, is produced by the PLOT=SMOOTH option in the LEVEL statement, it shows the smoothed level of the series. The second plot (Figure 34.6), produced by the PLOT=SMOOTH option in the SEASON statement, shows the smoothed seasonal component by itself. 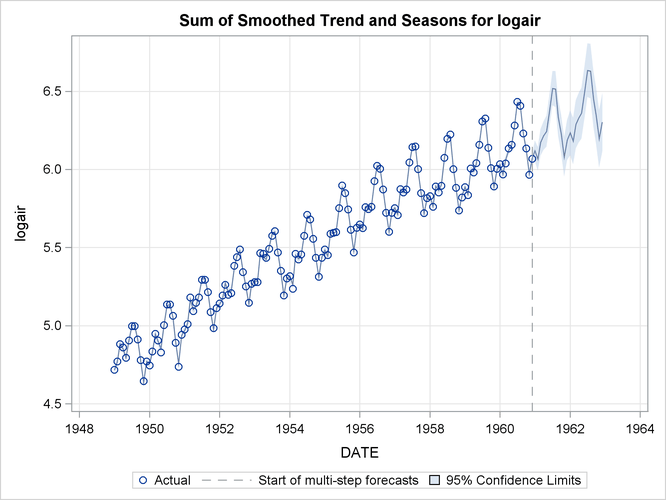 The plot of the sum of the trend and seasonal component, produced by the PLOT=DECOMP option in the FORECAST statement, is shown in Figure 34.7. You can see that, at least visually, the model seems to fit the data well. In all these decomposition plots the component estimates are extrapolated for two years in the future based on the LEAD=24 option specified in the FORECAST statement.